I saw the deep borings in the wooden slab of White Oak and began exploring the notion of “refuge”. Something was attracted to live within this part of the tree, something sought refuge and existence in this fortress, I could see the microcosm when looking closely. At the same time, the pattern in the wood and its DNA reminded me of desert landscapes from the southwest; the vast areas of wilderness. I began to create layers of air and sky by casting resin layers, relying on lost memories of desert sunsets above a remote beach. There were memories of clouds in the early morning and light at the golden evening hour. 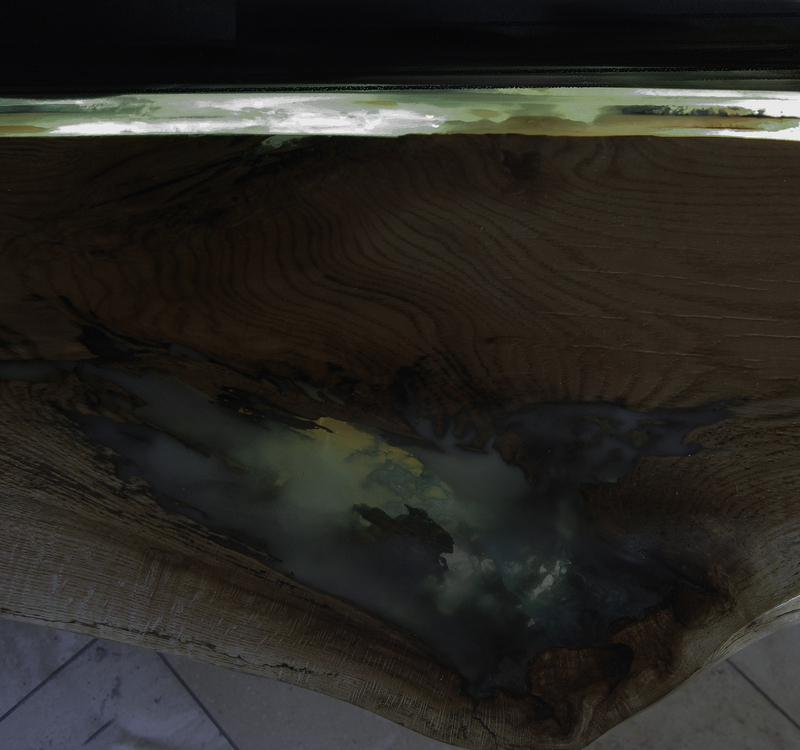 The various translucent layers, some with pearlecent and phosphorescent powders mixed with resin, emit an “other world” atmosphere. Immersed within the sky are spherical planets that, provide an “other” world dreamlike hallucination . “Every moment of light and dark is a miracle” says Walt Whitman and I wanted to create and capture these moments. The work “Refuge” is cocooned in light; a light created with LED lighting that I call the great light and phosphorescent light, the lesser light. The lesser light is “charged” by the LED light and continues to radiate “stored” energy as “light” long into the darkness. Light provides healing according to popular studies. Light is an element and theme in my work while I explore the idea of the spiritual powers of healing and light. Healing became an influence in my work while researching and understanding healing. 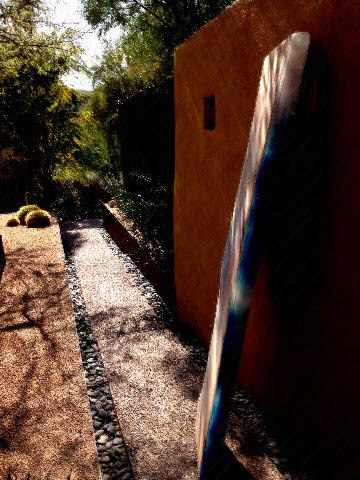 Embedded in all my recent work is earth from mission Chimayo outside Taos, New Mexico. Chimayo has been called “a place of healing”, http://taospueblo.com/ . I saw thousands of prayers posted as photos, hundreds of crutches hung on a wall and realized this too was a place of refuge. Many prayers are answered but many times it is not “God get me out of this” rather God get me through this. The more I meditate in prayer, the more I know that healing is much about surrendering. There is something special about the wilderness-the quiet and solitude, marveling at the beauty created by God. It is a spiritual experience for me. The same with creating art, a spiritual discipline for me, much like prayer. The process of creating this piece allowed me to reveal the mysterious realms of native folklore and culture. In this piece, the elements of sky, fire, earth and air are my way of capturing the essence of God. God is in the very nature of each element. 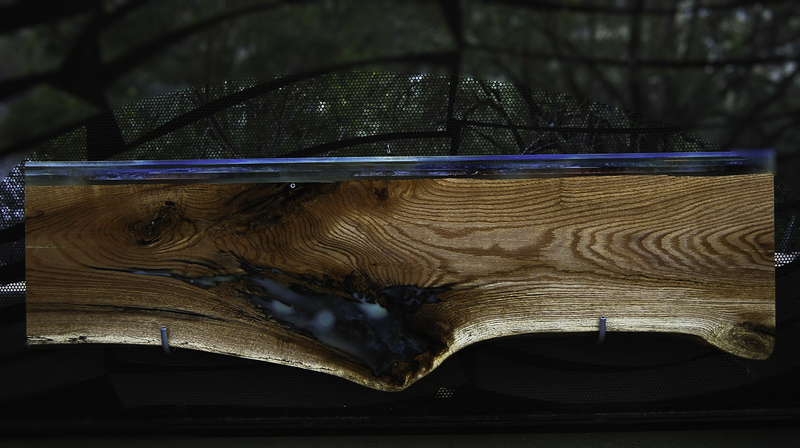 “Ancient Memories”…Refuge” 65″ x 20″ x 2″ White Oak, cast resin layers, LED lighting. I had many ideas, wishes and fantasies creating this piece of refuge and prayer. OK now I know you’re well…..maybe a little too busy. I owe you lunch! Going to have fun on Saturday!